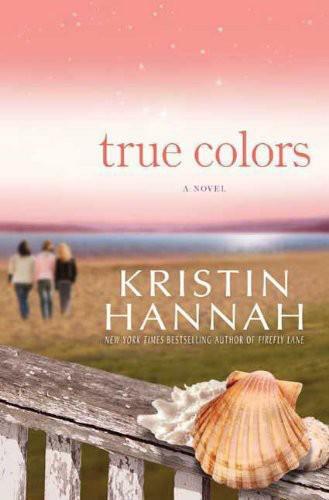 Well bloggers, I have just finished reading my 10th book this year. That is a huge accomplishment for me. I love to read. It is so relaxing and I can take it with me wherever I go! It requires no preparation, it doesn't make a mess. It takes me to places I have never been, and will likely never go. It helps me to understand things that I didn't pay much attention to before. It teaches me things about people and places. I learn new words and what they mean. It lets me have great conversations with my friends about books they have read. Reading is awesome. I just finished reading a book called True Colors by Kristen Hannah! It was great. I highly recommend it. I am not great at reviewing a book without giving all the good stuff away, but you can check out the synopsis here! I love to switch things up and read different kinds of books. My youngest son, Matt, has been reading a series and I think I am going to start that next. It is fun to talk to him about the book and compare notes. We read the first book in the Harry Potter series together and also the first 2 books in the Hunger Games series. I finished the third book, but Matt still has to catch up. I am always looking for new reading buddies, so if you have a favourite you would like to share with me, just leave me a note in the comments. It is looking like we are going to have great weather for the weekend. This makes me happy.....we deserve it after the snow showers we had on Wednesday! 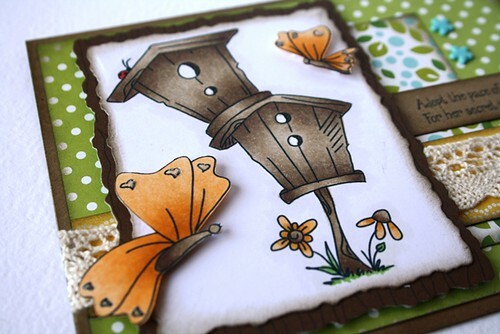 To celebrate the nice weather, I want to share a card that I made using one of Sassy Chery's digi stamps. I used the 'print & cut' feature on my Silhouette to cut her out and then used my Copics to add the colour. 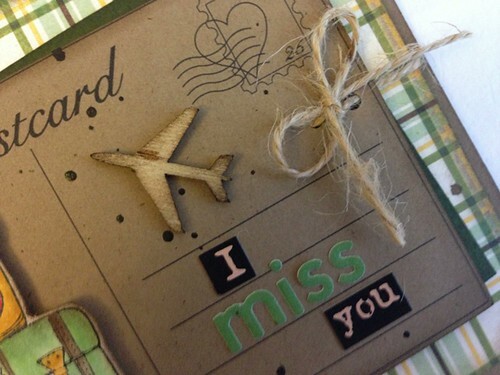 I embossed the background of my card and then added some die-cut clouds and my sentiment. The card layers are mounted on a kraft card base (my favourite) and I inked the edges with my Distress ink. It is Wednesday already!!!! This week is really flying by. This week the challenge for Little Red Wagon is 'Crimp My Style'! We are supposed to use something crimped. 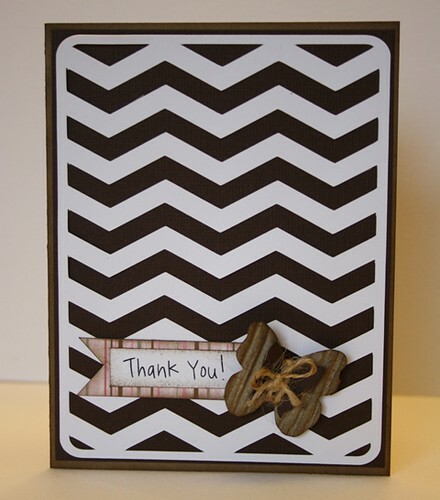 I am still recovering from a very busy couple of weeks so I kept my card clean and simple. 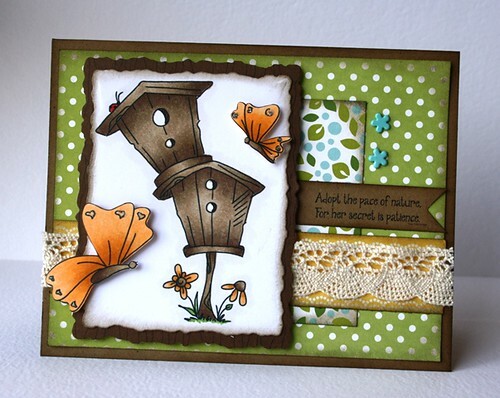 I used a butterfly die-cut from Jillibean for my crimped detail. I punched another butterfly using a Martha Stewart punch and layered them together and then tied some twine around them. My Silhouette Cameo came in handy too. 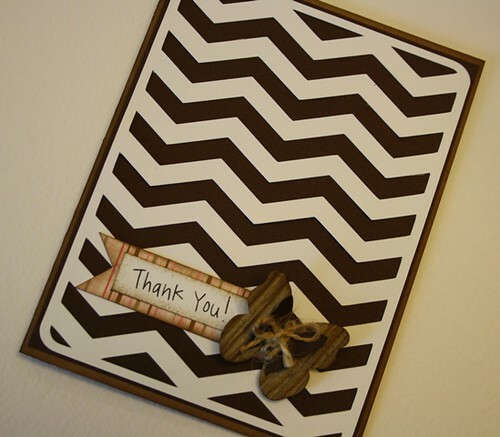 I created the background using a cutting file from Lori Whitlock from the Silhouette online store. The sentiment was done using a sketch font and my black sketch pen. Don't forget to visit the Little Red Wagon Blog and see what others are creating. Have a great day and thanks for stopping by! Good Morning!!!! It's Wednesday, and that means that it is time for another post for Little Red Wagon. I have had an incredibly busy and draining week. Last night, I still hadn't started my project for today's challenge (yikes!). Part of it was because I was so busy with other things, but I will be honest and say that most of the reason was because this challenge really had me stumped. Regan challenged us to use a cameo!?! I am not a cameo person.....or so I thought. Who am I kidding, I LOVE my Cameo. So I went to work and this is what I came up with. 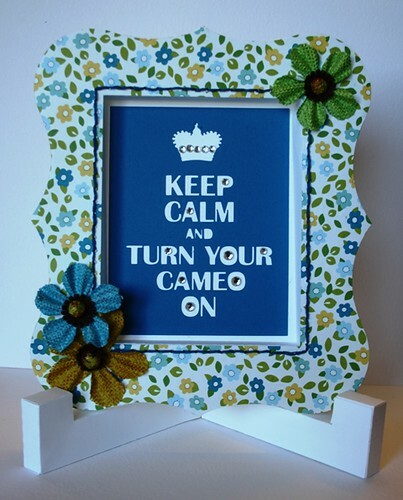 I used one of Lori Whitlock's new 3D frames from the Silhouette (Cameo) online store and then I found this awesome cut out that was perfect for this challenge. I dug into my wagon and found these Prima flowers that matched perfectly and added some stitching and a little bling! I am super impressed with my project. Putting together the frame was a little tricky, but I think it was so worth it. 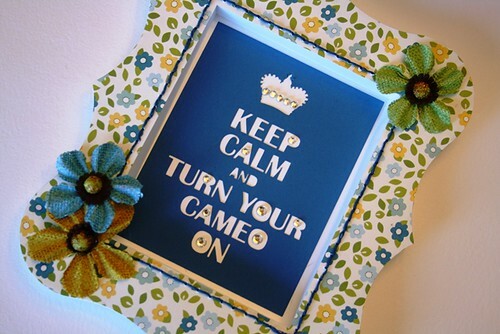 I am going to put this in my craft room, right next to my Cameo! Be sure to visit the other Little Red Wagon girls blogs and see what they did with this challenge. Maybe you will find time to play along. Hey everyone! This is my second post today (whoo hoo). If you are looking for Little Red Wagon, just scroll down! Today I have a card that I made for the Cutting Cafe using the Postcard set. 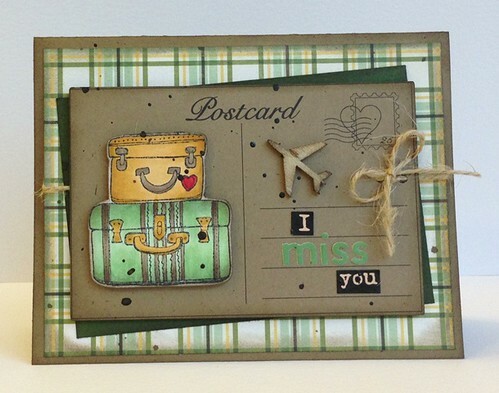 The set comes with 2 different styles of postcards that you can use for travel layouts, cards or projects. I loved the one with the heart stamp. I found this stamp in my stash and thought it went well with the postcard theme. 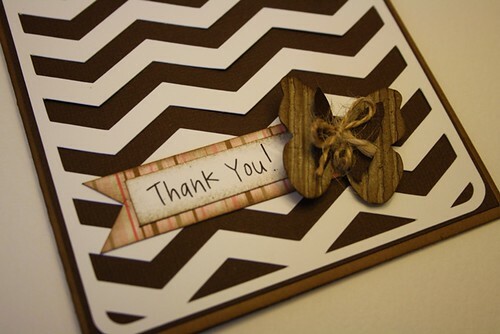 It is from Stamping Bella. 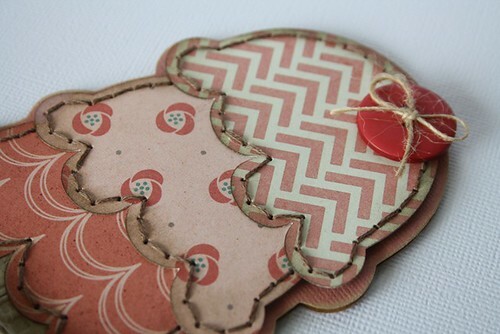 I also used one of Studio Calico's wood veneer shapes from my stash. I love these little treasures. I added some stickers for my sentiment and some twine for my bow. Once I was all finished I added some Mr Huey mist for interest. 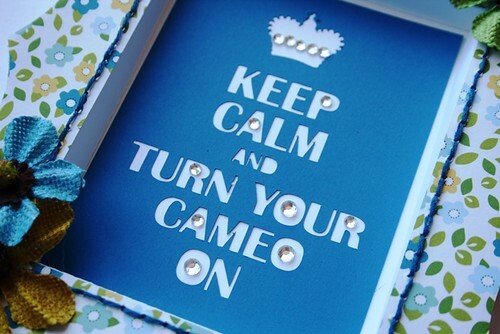 Be sure to check out the Cutting Cafe Blog later today and see what the rest of the design team has been up too. You are sure to be inspired. It's Wednesday, so that means a new challenge at Little Red Wagon. 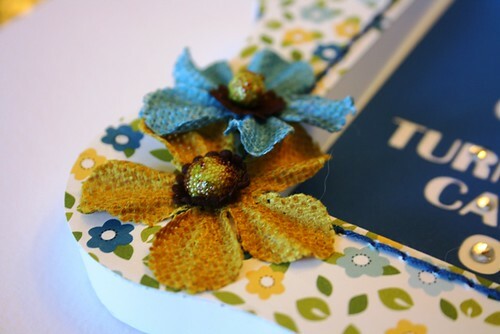 This week we are challenging everyone to use lace on your project. That one was a hard one for me. I am not really a 'lace' person. I did find some crochet trim in my wagon, so I thought I would give that a try. I used this amazing image from Sassy Cheryl and coloured it up with my Copics. 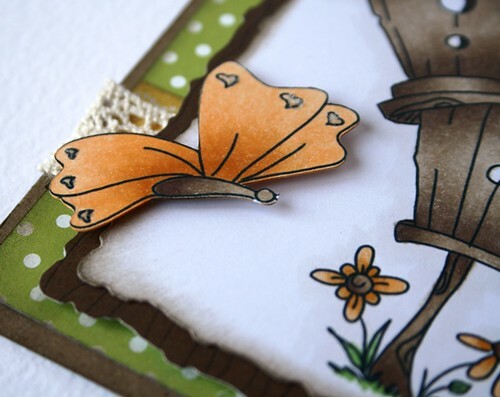 I used a Nestabilities die to cut around my image and then I matted it in the dark brown. I cut out the butterflies from another set from Sassy Cheryl and used my copics to colour them in too. I popped them up using foam adhesive. I hope you enjoy this weeks challenge and maybe you will find some time to play along. 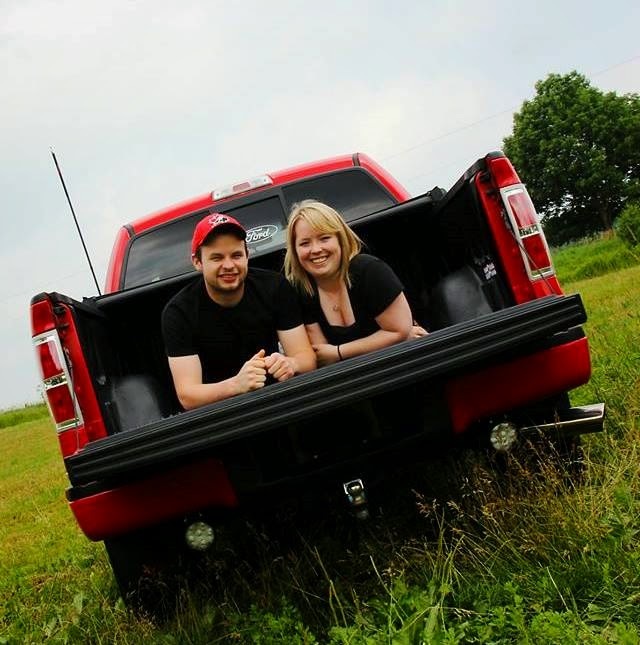 Visit the Little Red Wagon blog and also check out what the LRW girlfriends have created to inspire you. The links are along the sidebar of my blog. My First Project Life Layouts! As promised, I am back to share my latest layouts for Jason's travel book. 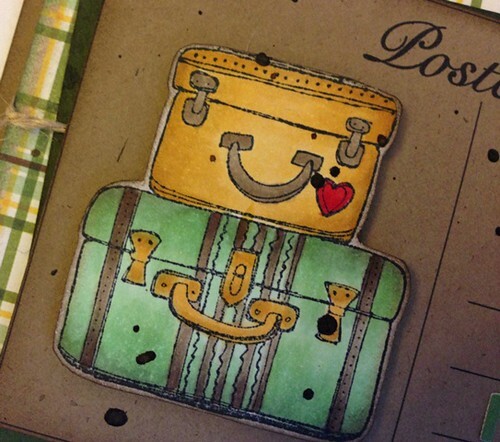 I have not done much on it lately and I am feeling very overwhelmed by the number of photos I have to scrapbook. 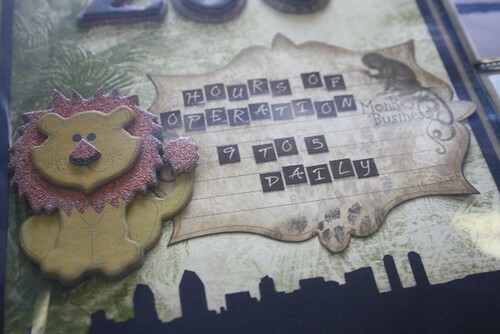 I decided that I would venture out and try the 'project life' style of scrapbooking. For those of you who don't know what that is, I will try to explain. 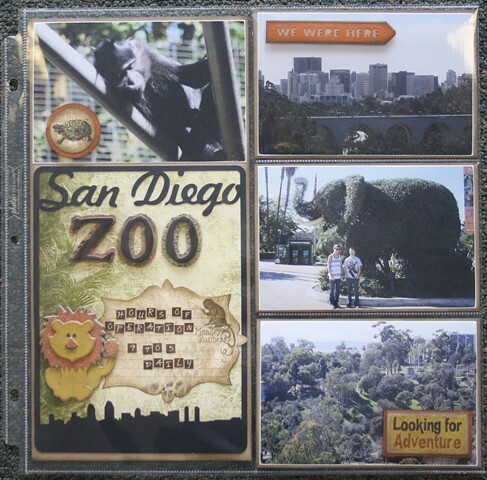 It is a more simplified way of scrapbooking using divided page protectors for your albums. 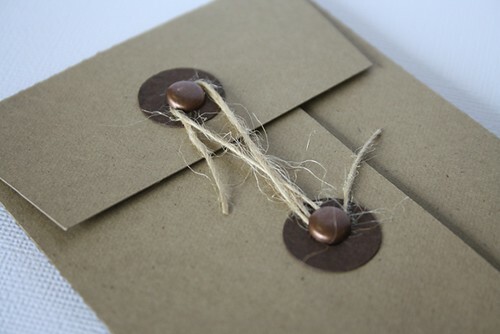 It allows you to just slide photos right into the sleeves and still add small areas of embellishments and journaling. 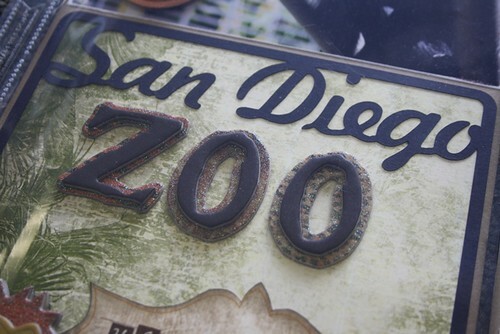 On our trip, we visited the San Diego Zoo and took quite a few photos. It was such a great day and I don't want to narrow it down any further than I already have. I will have many pages on all the different animals we interacted with and in order to make any progress on this, I had to do something. 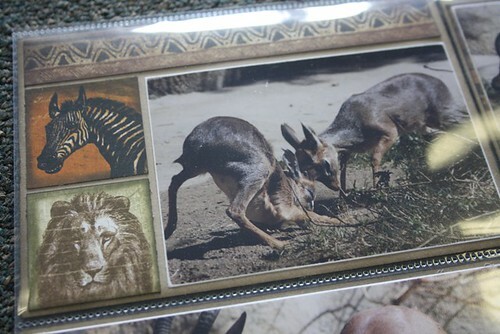 This is the first page that will appear in his album It will 'kick off' the zoo portion of the trip. I used a sleeve that has a large vertical section on the left (6x12 inches) and then 3 horizontal sections on the right (4x6 inches). I used a file from my Silhouette that had the frame and the word 'San Diego' already welded to it. 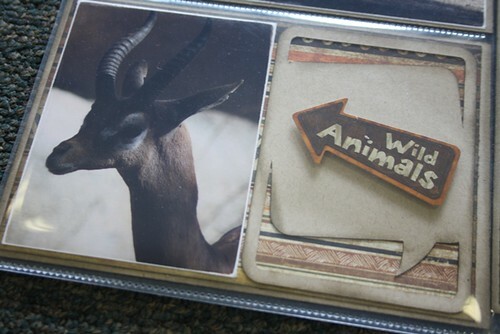 I added the chipboard letters to spell out Zoo. I created a sign and used stickers to add the 'hours of operation' for the time of year we were there. 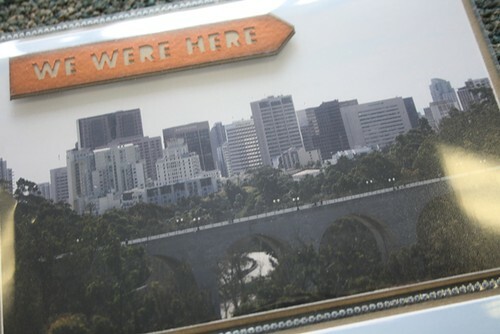 I used a chipboard lion to embellish and the bottom of the frame I cut out had the San Diego skyline. I added photos into the smaller sections, adding rubons and stickers to accent. I made this element using my Silhouette and backed it with a complimentary colour. Once I finished the front of the sleeve, I had to create the reverse side (or you will just see the back of my photos....and that is not very interesting). I incorporated lots of photos.....six to be exact! I cut out these 3x4 journal cards using my Silhouette and added some stickers that I had in my stash. 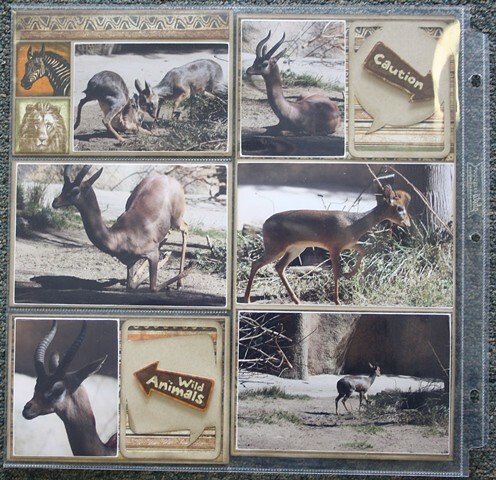 I accented with zoo themed papers from Bo Bunny (these have also been in my stash for a few years). The experience was pretty exciting and I felt like I was actually making progress. 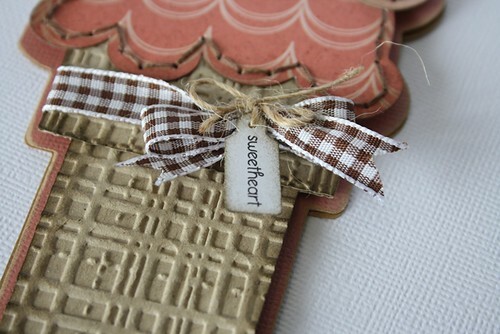 I am really liking the idea of this style of scrapbooking when I am working on a huge project like this. I have completed another set of pages that I will post next week! Be sure to visit again soon. Little Red Wagon & Cutting Cafe Reveal! Today is reveal day for Little Red Wagon and the Cutting Cafe. I combined the challenge for LRW with the file that I used for the Cutting Cafe and I think the result was pretty amazing. This week Janice (one of the girlfriends from LRW) challenged us to be a 'negative nellie'! She wants us to use the negative of a die-cut! Love this challenge. I chose a really cool file from the Cutting Cafe called the Tall Ice Cream Shaped Card and combined it with the String and Button Envelope! Here is what I created! 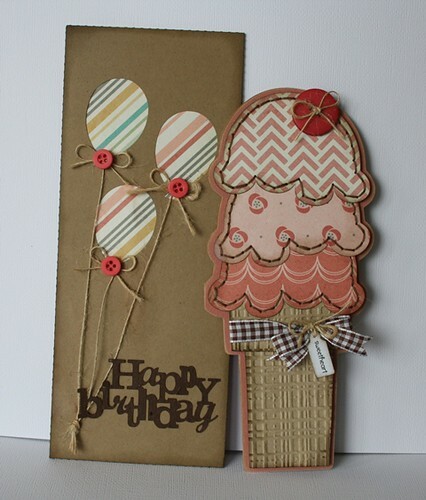 I used an embossing folder and my Cuttlebug to create the textured on the cone. 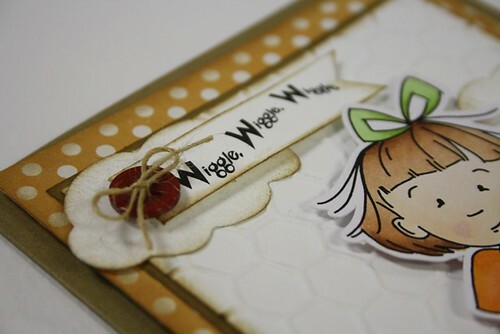 I used my favourite ribbon and twine to embellish, along with a tiny tag! 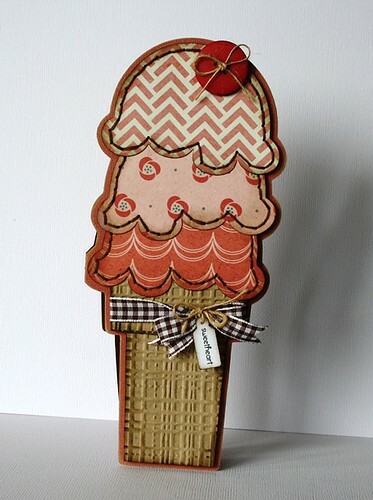 I stitched the 'ice cream' and added a button with some twine for the 'cherry on top'! For the 'negative nellie' part of the challenge, I cut some balloons out of the front of the envelope and placed a piece of matching striped paper behind them. 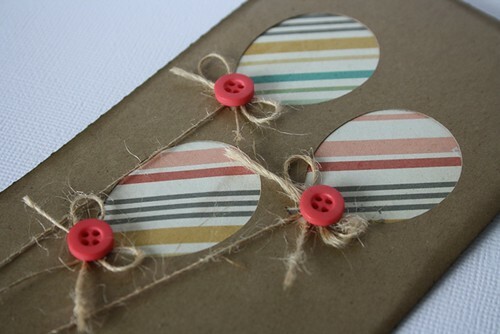 I added some twine for the balloon strings and embellished with a small button. This is the reverse side of the envelope. 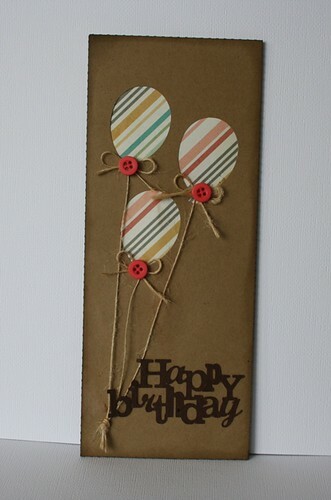 I used brads for the closure and more twine to match the strings of the balloons. Thanks for stopping by. Be sure to visit the Little Red Wagon girls and see what they have created and also check out the post later today on the Cutting Cafe blog and see what the rest of the team did with these amazing cutting files. 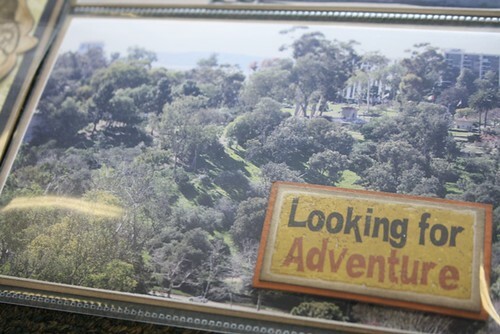 I hope you will visit again this week, as I reveal my first layout using the 'Project Life' style of scrapbooking. 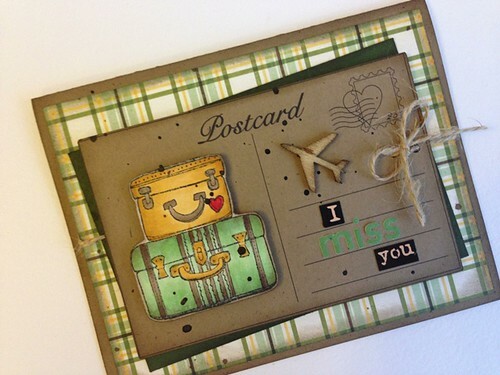 It has been so long since I have posted anything on my blog that did not have to do with scrapbooking or cardmaking! I love both of those things, so it makes sense that I post about them a lot, but I do other things too. This past weekend I had my family over for Easter. It was nice to visit with everyone, but it was a little different than our normal Easter because my Dad was missing :(. I have been missing him so much lately, especially with all the Ranger games during playoffs. I would love to share all the excitement with him. I know he is watching from above and he would be so proud of his team (and me for travelling to the games in Guelph), but it is just not the same. For my Easter dinner I tried a few new things. I made 2 new salads that were totally amazing (I will get to that in a minute) and I learned a new way to cook bacon that I just have to share. 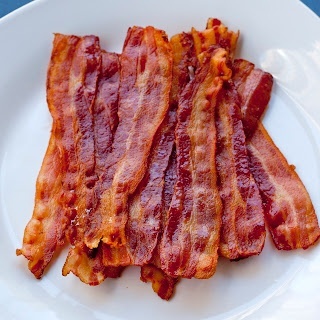 On Pinterest I saw how to cook bacon in one batch without the splatters and burns - this would make my life so much easier. I had to give it a try! It was a complete success! I was worried it would make a mess of my oven, but it didn't. It was completely mess free! I will never go back to my old way again. 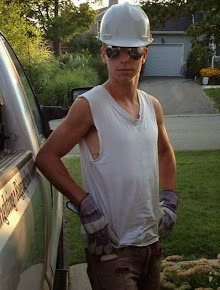 You can check out the post here! There are over 100 comments and they all say exactly what I did. It's amazing. Now, on to the salads!!! I recently received a few new recipes from a good friend, Lori! She is an amazing cook and an even more amazing person. They were both delicious so I thought I would share her recipes here (I know she would totally approve). Beat together all the ingredients for the dressing and refrigerate for 2-3 hours. Toss together the salad ingredients and generously coat with dressing. Mix ingredients together for dressing and refrigerate. Cut broccoli into bite size pieces and place in salad bowl. Add remaining ingredients. Toss with dressing. Hope you enjoyed this post......I really must get back into doing this more often. Stop by again soon.